"Galveston hurricane" redirects here. For other hurricanes that impacted Galveston, see Galveston hurricane (disambiguation). Surface weather analysis of the hurricane on September 8, just before landfall. The Great Galveston Hurricane, known regionally as the Great Storm of 1900, was the deadliest natural disaster in United States history, one of the deadliest hurricanes (or remnants) to affect Canada, and the fourth-deadliest Atlantic hurricane overall. The hurricane left between 6,000 and 12,000 fatalities in the United States; the number most cited in official reports is 8,000. Most of these deaths occurred in the vicinity of Galveston after storm surge inundated the entire island with 8 to 12 feet (2.4 to 3.7 m) of water. In addition to the number killed, every house in the city sustained damage, with at least 3,636 destroyed. Approximately 10,000 people in the city were left homeless, out of a total population of nearly 38,000. The disaster ended the Golden Era of Galveston, as the hurricane alarmed potential investors, who turned to Houston instead. The Gulf of Mexico shoreline of Galveston island was subsequently raised by 17 ft (5.2 m) and a 10 mi (16 km) seawall erected. The first observed hurricane of the season, the tropical cyclone was first detected by a ship well east of the Windward Islands on August 27. Initially at tropical storm intensity, it slowly strengthened while moving steadily west-northwestward and entered the northeastern Caribbean Sea on August 30. The storm made landfall in the Dominican Republic as a weak tropical storm on September 2. It weakened slightly while crossing Hispaniola, before re-emerging into the Caribbean Sea later that day. On September 3, the cyclone struck modern day Santiago de Cuba Province and then slowly drifted along the southern coast of Cuba. Upon reaching the Gulf of Mexico on September 6, the storm strengthened into a hurricane. Significant intensification followed and the system peaked as a Category 4 hurricane with maximum sustained winds of 145 mph (230 km/h) on September 8. Early on the next day, it made landfall near present day Jamaica Beach, Texas. [nb 1] The cyclone weakened quickly after moving inland and fell to tropical storm intensity late on September 9. The storm turned east-northeastward and became extratropical over Iowa on September 11. The extratropical system strengthened while accelerating across the Midwestern United States, New England, and Eastern Canada before reaching the Gulf of Saint Lawrence on September 13. After striking Newfoundland later that day, the remnants entered the far North Atlantic Ocean and weakened, finally dissipating near Iceland on September 15. The storm's origins are unclear, because of the limited observational methods available to meteorologists at the time. Ship reports were the only reliable tool for observing hurricanes at sea, and because wireless telegraphy was in its infancy, these reports were not available until the ships put in at a harbor. The 1900 storm, like many powerful Atlantic hurricanes, is believed to have begun as a Cape Verde hurricane—a tropical wave moving off the western coast of Africa. The first formal sighting of the hurricane's precursor occurred on August 27, about 1,000 miles (1,600 km) east of the Windward Islands, when a ship recorded an area of "unsettled weather". The storm passed through the Leeward Islands on August 30, probably as a tropical depression as indicated by barometric pressure reports from Antigua. Three days later, Antigua reported a severe thunderstorm passing over, followed by the hot, humid calmness that often occurs after the passage of a tropical cyclone. By September 1, U.S. Weather Bureau observers were reporting on a "storm of moderate intensity (not a hurricane)" southeast of Cuba. Continuing westward, the storm made landfall on southwest Cuba on September 3, dropping heavy rains. On September 5, it emerged into the Florida Straits as a tropical storm or a weak hurricane. Conditions in the Gulf of Mexico were favorable for further strengthening of the storm. The Gulf had seen little cloud cover for several weeks, and the seas were "as warm as bathwater", according to one report. The Weather Bureau ignored reports from Cuban meteorologists because they expected the storm to curve northeast along the coast of North America: "Assumption became fact as the official government reports stated, wrongly, that the storm was traveling northeast in the Atlantic." However, a region of high pressure had pushed the storm to the west into the Gulf of Mexico. The storm was reported to be north of Key West on September 6, Late on September 6, the ship Louisiana encountered the hurricane after departing New Orleans. Captain Halsey estimated wind speeds of 100 mph (160 km/h), which corresponds to Category 2 intensity on the modern-day Saffir–Simpson Hurricane Scale. In the early morning hours of Friday, September 7, the Weather Bureau office in New Orleans, Louisiana, issued a report of heavy damage along the Louisiana and Mississippi coasts. Details of the storm were not widespread; damage to telegraph lines limited communication. The Weather Bureau's central office in Washington, D.C., ordered storm warnings raised from Pensacola, Florida, to Galveston. The hurricane continued to strengthen significantly while heading west-northwestward across the Gulf of Mexico, becoming a Category 3 hurricane at 06:00 UTC on September 7 and reaching Category 4 intensity about 12 hours later. Upon becoming a Category 4 hurricane, the cyclone reached its maximum sustained wind speed of 145 mph (230 km/h). By the afternoon of September 7, large swells from the southeast were observed on the Gulf, and clouds at all altitudes began moving in from the northeast. Both of these observations are consistent with a hurricane approaching from the east. The Galveston Weather Bureau office raised its double square flags; a hurricane warning was in effect. On September 8, the hurricane weakened slightly and recurved to the northwest while approaching the coast of Texas. By 22:00 UTC, the Weather Bureau office in Galveston was observing sustained hurricane-force winds. The cyclone made landfall around 02:00 UTC on September 9 near modern-day Jamaica Beach with sustained winds of 140 mph (220 km/h). Upon making landfall, it was estimated that the hurricane had a atmospheric pressure of 936 mbar (27.6 inHg), the lowest pressure associated with the system. While crossing Galveston Island and West Bay, the eye passed just west of the city of Galveston. The hurricane quickly weakened after moving inland, weakening to a Category 2 around 06:00 UTC on September 9 and then to a Category 1 hurricane about 12 hours later. Later that day, it curved northward and weakened to a tropical storm at 18:00 UTC. About 24 hours later, the cyclone weakened to a tropical depression over Kansas on September 10. The storm lost tropical characteristics and transitioned into an extratropical cyclone over Iowa by 12:00 UTC on the following day. Moving rapidly east-northeastward, the extratropical system re-intensified, becoming the equivalent of a Category 1 hurricane over Ontario on September 13. After crossing Newfoundland and entering the far northern Atlantic, the remnants of the hurricane weakened and were last noted near Iceland on September 15. In 1900, the city of Galveston, Texas, was a booming town. According to the 1900 Census, the population of Galveston was 37,788, an increase from 29,084 people recorded in the 1890 Census. The city was fourth largest municipality in the state of Texas in 1900 and among the highest per capita income rates in the United States. Galveston had many ornate business buildings in a downtown section called The Strand, which was considered the "Wall Street of the Southwest." The city's position on the natural harbor of Galveston Bay along the Gulf of Mexico made it the center of trade in Texas, and one of the busiest ports in the nation. With this prosperity came a sense of complacency. A quarter of a century earlier, the nearby town of Indianola on Matagorda Bay was undergoing its own boom and was second to Galveston among Texas port cities. Then in 1875, a powerful hurricane blew through, nearly destroying the town. Indianola was rebuilt, though a second hurricane in 1886 caused residents to simply give up and move elsewhere. Many Galveston residents took the destruction of Indianola as an object lesson on the threat posed by hurricanes. Galveston is built on a low, flat island, little more than a large sandbar along the Gulf Coast. These residents proposed a seawall be constructed to protect the city, but their concerns were dismissed by the majority of the population and the city's government. Since its formal founding in 1839, the city of Galveston had weathered numerous storms, all of which the city survived with ease. Residents believed any future storms would be no worse than previous events. [nb 5] In order to provide an official meteorological statement on the threat of hurricanes, Galveston Weather Bureau section director Isaac Cline wrote an 1891 article in the Galveston Daily News in which he argued not only that a seawall was not needed to protect the city, but also that it would be impossible for a hurricane of significant strength to strike the island. The seawall was not built, and development activities on the island actively increased its vulnerability to storms. Sand dunes along the shore were cut down to fill low areas in the city, removing what little barrier there was to the Gulf of Mexico. On September 4, the Galveston office of the National Weather Bureau (as it was then called) began receiving warnings from the Bureau's central office in Washington, D.C., that a tropical storm had moved northward over Cuba. At the time, they discouraged the use of terms such as tornado or hurricane to avoid panicking residents in the path of any storm event. The Weather Bureau forecasters had no way of knowing the storm's trajectory, as Weather Bureau director Willis Moore implemented a policy to block telegraph reports from Cuban meteorologists at the Belen Observatory in Havana – considered one of the most advanced meteorological institutions in the world at the time – due to tensions remaining in the aftermath of the Spanish–American War. Moore also changed protocol to force local Weather Bureau offices to seek authorization from the central office before issuing storm warnings. Weather Bureau forecasters believed the storm would travel northeast and affect the mid-Atlantic coast. "To them, the storm appeared to have begun a long turn or 'recurve' that would take it first into Florida, then drive it northeast toward an eventual exit into the Atlantic." Cuban forecasters adamantly disagreed, saying the hurricane would continue west. One Cuban forecaster predicted the hurricane would continue into central Texas near San Antonio. On the morning of September 8, the swells continued despite only partly cloudy skies. Largely because of the unremarkable weather, few residents saw cause for concern. Few people evacuated across Galveston's bridges to the mainland, and the majority of the population was unconcerned by the rain clouds that began rolling in by midmorning. Isaac Cline claimed that he took it upon himself to travel along the beach and other low-lying areas warning people personally of the storm's approach. These reports by Cline and his brother, Galveston meteorologist Joseph L. Cline, have been called into question in recent years, as no other survivors corroborated these accounts. In fact, Cline's role in the disaster is the subject of some controversy. Supporters point to Cline's issuing a hurricane warning without permission from the Bureau's central office; detractors (including author Erik Larson) point to Cline's earlier insistence that a seawall was unnecessary and his notion that an intense hurricane could not strike the island, even considering it "simply an absurd delusion" to believe otherwise. Antigua reported a severe thunderstorm passing over on August 30, with lower barometric pressures and up to 2.6 in (66 mm) of rainfall recorded on the island. In Puerto Rico, the storm produced winds up to 43 mph (69 km/h) at San Juan. Heavy rainfall fell in Cuba in association with the cyclone, including up to 12.58 in (320 mm) in a 24‑hour period in the city of Santiago de Cuba. The city experienced its worst weather since 1877. The southern end of the city was submerged with about 5 ft (1.5 m) of water. Firefighters and police rescued and aided stranded residents. St. George, a German steamer, ran aground at Daiquirí. A telegraph from the mayor of Trinidad, who was asking for assistance from the United States Military Government in Cuba, indicated that the storm destroyed all crops and left many people destitute. In Jamaica, heavy rainfall from the storm caused all rivers to swell. Floodwaters severely damaged banana plantations and washed away miles of railroads. Damage estimates ranged in the thousands of British pounds. The Great Galveston hurricane made landfall on September 9, 1900, near Galveston, Texas. It had estimated winds of 145 mph (233 km/h) at landfall, making the cyclone a Category 4 storm on the modern day Saffir–Simpson Hurricane Scale. The hurricane caused great loss of life, with a death toll of between 6,000 and 12,000 people; the number most cited in official reports is 8,000, giving the storm the third-highest number of deaths of all Atlantic hurricanes, after the Great Hurricane of 1780 and Hurricane Mitch in 1998. The Galveston hurricane of 1900 is the deadliest natural disaster to strike the United States. This loss of life can be attributed to the fact that officials for the Weather Bureau in Galveston brushed off the reports because the city had "weathered them all" and they did not realize the threat. The second-deadliest storm to strike the United States, the San Ciriaco hurricane of 1899, caused around 3,400 deaths. More than $34 million in damage occurred throughout the United States, with about $30 million in Galveston County, Texas, alone. If a similar storm struck in 2010, damage would be approximately $104.33 billion (2010 USD), based on normalization, a calculation that takes into account changes in inflation, wealth, and population. In comparison, the costliest United States hurricanes – Hurricane Katrina in 2005 and Hurricane Harvey in 2017 – both caused about $125 billion in damage. The hurricane occurred before the practice of assigning official code names to tropical storms was instituted, and thus it is commonly referred to under a variety of descriptive names. Typical names for the storm include the Galveston Hurricane of 1900, the Great Galveston Hurricane, and, especially in older documents and publications, the Galveston Flood. It is often referred to by Galveston locals as the Great Storm or the 1900 Storm. Portions of southern Florida experienced tropical storm force winds, with a sustained wind speed of 48 mph (77 km/h) in Jupiter and 40 mph (64 km/h) in Key West. The hurricane left "considerable damage" in the Palm Beach area. Many small boats were torn from their moorings and capsized. The bulkhead of the pier was washed away, while docks and a number of seawalls were damaged. Rainfall in the state peaked at 5.7 in (140 mm) in Hypoluxo. High winds in North Florida downed telegraph lines between Jacksonville and Pensacola. In Mississippi, the city of Pass Christian recorded winds of 58 mph (93 km/h). Tides produced by the storm inundated about 200 ft (61 m) of railroad tracks in Pascagoula (then known as Scranton), while a quarantine station on Ship Island was swept away. In Louisiana, the storm produced gale force winds as far inland as DeRidder and as far east as New Orleans, with hurricane-force winds observed in Cameron Parish. Along the coast, storm surge inundated Johnson Bayou, while tides at some locations reached their highest level since the Indianola hurricane of 1875. Winds and storm surge caused severe damage to rice crops, with at least 25% destroyed. The community of Pointe à la Hache experienced at total loss of rice crops. Farther east, roads were flooded by storm surge in the communities of Gretna and Harvey near New Orleans, leaving the streets impassable via horses. Winds downed telegraph lines in the southeastern Louisiana in the vicinity of Port Eads. Two men went missing and were presumed to have drowned after sailing away from Fort St. Philip and not returning in a timely manner. However, they were both later found alive. Nearly all of the damage in the United States occurred in Texas, with much of the damage in Galveston. However, many cities outside of Galveston also reported serious damage, with a number of cities reportedly nearly or completely losing all buildings or homes, including Alta Loma, Alvin, Angleton, Brazoria, Brookshire, Chenango, El Campo, Pearland, and Richmond. Throughout Texas – in areas other than Galveston – at least $3 million in damage occurred to cotton crops, $75,000 to telegraph and telephone poles, and $60,000 to railroads. At Alvin, 8.05 in (204 mm) of rain fell on September 8, the highest 24-hour total for that city in the month of September. The city suffered nine fatalities and about $50,000 in damage. In West Columbia, the storm destroyed the old capitol building of the former Republic of Texas. Eight deaths occurred in the city. In Quintana, the city experienced extensive damage during this storm and a flood in 1899, causing portions of the community to be abandoned. Throughout Brazoria County alone, the hurricane caused nearly $200,000 in damage and 47 deaths. Houston also experienced significant damage. The hurricane wrought damage to many buildings, including a Masonic temple, a railroad powerhouse, an opera house, a courthouse, and a number of businesses, churches, homes, hotels, and school buildings. Streets were littered with branches from shade trees and downed electrical wires, leaving several roads completely impassable to cars. The city of Houston suffered about $250,000 in damage and two deaths, one of which occurred when a man was struck by falling timber. A train heading for Galveston left Houston on the morning of September 8 at 9:45 a.m. It found the tracks washed out, and passengers were forced to transfer to a relief train on parallel tracks to complete their journey. Even then, debris on the track slowed the train's progress to a crawl. The 95 travelers on the train from Beaumont found themselves at the Bolivar Peninsula waiting for the ferry that would carry them, train and all, to the island. When it arrived, the high seas forced the ferry captain to give up on his attempt to dock. The train crew attempted to return the way they had come, but rising water blocked the train's path. Ten refugees from the Beaumont train sought shelter at the Point Bolivar lighthouse with 200 residents of Port Bolivar who were already there. The 85 who stayed with the train died when the storm surge overran the tops of the cars, while every person inside the lighthouse survived. At the time of the 1900 hurricane, the highest point in the city of Galveston was only 8.7 ft (2.7 m) above sea level. The hurricane brought with it a storm surge of over 15 ft (4.6 m) that washed over the entire island. Storm surge and tides began flooding the city by the early morning hours of September 8. Water rose steadily from 3:00 p.m. CST (2100 UTC) until approximately 7:30 p.m. (0130 UTC September 9), when eyewitness accounts indicated that water rose about 4 ft (1.2 m) in just four seconds. An additional 5 ft (1.5 m) of water had flowed into portions of the city by 8:30 p.m. (0230 UTC September 9). The cyclone dropped 9 in (230 mm) of precipitation in Galveston on September 8, setting a record for the most rainfall for any 24-hour period in the month of September in the city's history. The highest measured wind speed was 100 mph (160 km/h) just after 6 p.m. on September 8 (0000 UTC September 9), but the Weather Bureau's anemometer was blown off the building shortly after that measurement was recorded. Contemporaneous estimates placed the maximum sustained wind speed 120 mph (190 km/h). 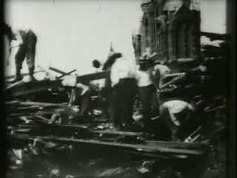 However, survivors reported observing bricks, slate, timbers, and other heavy objects becoming airborne, indicating that winds were likely stronger. Later estimates placed the hurricane at the higher Category 4 classification on the Saffir–Simpson Hurricane Scale. The lowest recorded barometric pressure was 28.48 inHg (964.4 hPa), considered at the time to be so low as to be obviously in error. Modern estimates later placed the storm's central pressure at 27.49 inHg (930.9 hPa), but this was subsequently adjusted to the storm's official lowest measured central pressure of 27.63 inHg (935.7 hPa). Searching for bodies in Galveston in the aftermath of the storm of 1900. At the time this film was shot, the stench of hundreds of bodies could be smelled for miles. One body was discovered (but not filmed) while the camera crew was present. Few streets in the city escaped wind damage and all streets suffered water damage, with much of the destruction caused by storm surge. All bridges connecting the island to the mainland were washed away, while approximately 15 mi (24 km) of railroad track was destroyed. Winds and storm surge also downed electrical, telegraph, and telephone wires. The surge swept buildings off their foundations and dismantled them. Many buildings and homes destroyed other structures after being pushed into them by the waves, which even demolished structures built to withstand hurricanes. Every home in Galveston suffered damage, with 3,636 homes destroyed. Approximately 10,000 people in the city were left homeless, out of a total population of nearly 38,000. The Tremont Hotel, where hundreds of people sought refuge during the storm, was severely damaged. All public buildings also suffered damage, including city hall – which was completely deroofed – a hospital, a city gas works, a city water works, and the custom house. The Grand Opera House also sustained extensive damage, but was quickly rebuilt. Three schools and St. Mary's University were nearly destroyed. Many places of worship in the city also received severe damage or were completely demolished. Of the 39 churches in Galveston, 25 experienced complete destruction, while the others received some degree of damage. During the storm, the St. Mary's Orphans Asylum, owned by the Sisters of Charity of the Incarnate Word, was occupied by 93 children and 10 sisters. As tides began approaching the property, the sisters moved the children into the girl's dorm, as it was newer and sturdier. Realizing they were under threat, the sisters had the children repeatedly sing Queen of the Waves to calm them. As the collapse of the building appeared imminent, the sisters used a clothes line to tie themselves to six to eight children. The building eventually collapsed. Only three of children and none of the sisters survived. The storm destroyed about 7,000 buildings of all uses in Galveston alone, which included businesses, churches, convents, hotels, and houses. The few buildings that survived, mostly solidly built mansions and houses along the Strand District, are today maintained as tourist attractions. Early property damage estimates were placed at $25 million. However, itemized estimates from 1901 based on assessments conducted by the Galveston News, the Galveston chamber of commerce, a relief committee, and multiple insurance companies indicated that the storm caused just over $17 million in damage throughout Galveston, including about $8.44 million to residential properties, $500,000 to churches, $656,000 to wharves and shipping properties, $580,000 to manufacturing plants, $397,000 to mercantile buildings, $1.4 million to store merchandise, $670,000 to railroads and telegraph and telephone services, $416,000 to products in shipment, $336,000 to municipality properties, $243,000 to county properties, and $3.16 million to United States government properties. The total also included $115,000 in damage to schools and approximately $100,000 in damage to roads. However, Isaac Cline's post-storm report stated that damage in Galveston County reached about $30 million. The area of destruction – an area in which nothing remained standing after the storm – was approximately 1,900 acres (770 ha) of land and was arc-shaped, with complete demolition of structures in the west, south, and eastern portions of the city, while the north-central section of the city suffered the least amount of damage. In the immediate aftermath of the storm, a 3 mi (4.8 km) long, 30 ft (9.1 m) wall of debris was situated in the middle of the island. As severe as the damage to the city's buildings was, the death toll was even greater. Because of the destruction of the bridges to the mainland and the telegraph lines, no word of the city's destruction was able to reach the mainland. Many who died had their corpses piled onto carts for burial at sea. At 11 a.m. (1700 UTC) on September 9, one of the few ships at the Galveston wharfs to survive the storm, the Pherabe, arrived in Texas City on the western side of Galveston Bay. It carried six messengers from the city. When they reached the telegraph office in Houston at 3 a.m. on September 10, a short message was sent to Texas Governor Joseph D. Sayers and U.S. President William McKinley: "I have been deputized by the mayor and Citizen's Committee of Galveston to inform you that the city of Galveston is in ruins." The messengers reported an estimated five hundred dead; this was initially considered to be an exaggeration. The citizens of Houston knew a powerful storm had blown through and had prepared to provide assistance. Workers set out by rail and ship for the island almost immediately. Rescuers arrived to find the city completely destroyed. A canvas conducted by the Morrison and Fourmy Company in early 1901 indicated a population loss of 8,124, though the company believed that about 2,000 people left the city after the storm and never returned. On this basis, the death toll is no less than 6,000, while estimates range up to 12,000. It is believed 8,000 people—20% of the island's population—had lost their lives. Most had drowned or been crushed as the waves pounded the debris that had been their homes hours earlier. A number of fatalities also occurred after strong winds turned debris into projectiles. Many survived the storm itself but died after several days being trapped under the wreckage of the city, with rescuers unable to reach them. The rescuers could hear the screams of the survivors as they walked on the debris trying to rescue those they could. More people were killed in this single storm than the total of those killed in at least the next two deadliest tropical cyclones that have struck the United States since. The Galveston Hurricane of 1900 remains the deadliest natural disaster in U.S. history. The dead bodies were so numerous that burying all of them was impossible. Initially, bodies were collected by "dead gangs" and then given to 50 African American men – who were forcibly recruited at gunpoint – to load them on to a barge. About 700 bodies were taken out to sea to be dumped. However, after gulf currents washed many of the bodies back onto the beach, a new solution was needed. Funeral pyres were set up on the beaches, or wherever dead bodies were found, and burned day and night for several weeks after the storm. The authorities passed out free whiskey to sustain the distraught men conscripted for the gruesome work of collecting and burning the dead. The extratropical remnants of the cyclone re-intensified to the equivalency of a tropical storm and continued to strengthen, bringing strong winds to the Midwestern United States. After moving northward from Texas into Oklahoma, the storm produced winds of near 30 mph (48 km/h) at Oklahoma City. Strong winds in Missouri toppled a brick wall under construction in St. Joseph fell over, killing a man and severely injuring another. In Illinois, particularly hard hit was the city of Chicago, which experienced wind gusts up to 84 mph (135 km/h). Thousands of dollars in damage occurred to roofs, trees, signs, and windows. Several people were injured and two deaths occurred in the city, one from a live wire and the other was a drowning after a boat capsized in Lake Michigan. In Wisconsin, a bateau with 18 people on board sank in the Eau Claire River, drowning 6 men and nearly taking the lives of the others. Heavy rains fell in parts of Minnesota. The Minneapolis–Saint Paul area recorded 4.23 in (107 mm) of precipitation over a period of 16-hours. Farther north, several washouts occurred, especially at the northern areas of the state. A long bridge, along with a few train cars, were swept away. In Michigan, the storm produced winds around 60 mph (97 km/h) at Muskegon. Tides from Lake Michigan were the highest in several months. The city of Marshall experienced "the severest windstorm of the season", which uprooted trees and damaged several buildings. Throughout the state, winds left between $12,000 and $15,000 in losses to peach orchards, with many peach trees uprooted. Significant losses to apples and pears also occurred. Rough seas in Lake Erie resulted in several maritime incidents offshore Ohio. The John B. Lyon, a 255 ft (78 m) steamer, capsized about 5 mi (8.0 km) north of Conneaut. Fourteen out of sixteen crew members drowned. A survivor suggested that the ship being overloaded may have been a factor in its sinking. About 10 mi (16 km) farther north, the schooner Dundee sank, causing at least one death. In another incident nearby, the steamer City of Erie, with about 300 passengers aboard, was hit by a tidal wave that swept over the bulwarks. The engine slowed and the steamers later reached safety in Canada with no loss of lives. In Toledo, strong winds disrupted telegraph services. Winds also blew water out of part of the Maumee River and Maumee Bay to such an extent that they were impassable by vessels due to low water levels. A number of vessels were buried in mud several feet deep, while about 20 others were beached. Of the many cities in New York impacted by the remnants of the hurricane, Buffalo was among the hardest hit. There, winds peaked at 78 mph (126 km/h), downing hundreds of electrical, telegraph, and telephone wires, while numerous trees toppled and some branches fell onto roadways. An oil derrick blew away and landed on the roof of a house, crushing the roof and nearly killing the occupants. A newly-built iron works building was virtually destroyed, causing a loss of about $10,000. At the Pan-American Exposition, the storm damaged several structures, including part of the government building, while two towers were destroyed. Losses at the exposition alone were conservatively estimated at $75,000. One death occurred in Buffalo after a woman inadvertently touched a downed electrical wire obscured by debris. Several nearby resorts received extensive damage. At Woodlawn Beach, several dozens of small boats and a pier were destroyed. Nearly all vessels owned by the Buffalo Canoe Club suffered severe damage or destruction at Crystal Beach. A toboggan slide and a restaurant were also destroyed. Losses Crystal Beach reached about $5,000. Heavy crop losses occurred over western New York, with fallen apples and peaches completely covering the ground at thousands of acres of orchards. Losses reportedly ranged in the hundreds of thousands of dollars. The rapidly moving storm was still exhibiting winds of 65 mph (105 km/h) while passing well north of New York City on September 12. The New York Times reported that pedestrian-walking became difficult and that one death was attributed to the storm. A sign pole, snapped by wind, landed on a 23-year-old man, crushing his skull and killing him instantly, while two others were knocked unconscious. Awnings and signs on many buildings broke and the canvas roofing at the Fire Department headquarters was blown off. Closer to the waterfront, along the Battery seawall, waves and tides were reported to be some of the highest in recent memory of the fishermen and sailors. Spray and debris were thrown over the wall, making working along the waterfront dangerous. Small craft in New York Harbor were thrown off course and tides and currents in the Hudson River made navigation difficult. In Brooklyn, The New York Times reported that trees were uprooted, signs and similar structures were blown down, and yachts were torn from moorings with some suffering severe damage. Because of the direction of the wind, Coney Island escaped the fury of the storm, though a bathing pavilion at Bath Beach suffered damage from wind and waves. In Connecticut, winds gusted up to about 40 mph (64 km/h). The apple crops, already endangered by drought conditions, suffered severe damage, with reportedly "hardly an apple left on a tree in the entire state". Prior to the storm, the apple crop was considered the largest in years. In the town of Orange, twelve large tents at a fair were ripped. At another fair in New Milford, fifteen tents collapsed, forcing closure of the fair. Along the coast, the storm produced abnormally high tides, with tides reaching their highest heights in six years at Westbrook. Water reached the bulkheads and remained there for several hours. In Rhode Island, the storm left damage in the vicinity of Providence. Telegraph and telephone services were interrupted, but not to such a large extent. Some small crafts in Narragansett Bay received damage, while apple orchards experienced slight losses. Lightning produced by the storm ignited a number of brush fires in Massachusetts, particularly in the southeastern portions of the state, with winds spreading the flames. In Plymouth and other nearby towns, some residents evacuated from the fires by boat. Most cottages around the Big Long, Gallows, Halfway, and Little Long ponds were reduced to burning coals. In Everett, orchards in the Woodlawn section suffered complete losses of fruit. Two wooden frame building were demolished, while winds also toppled fences throughout the city. Winds damaged many telephone and electric wires in Cambridge. A lineman sent to fix the electrical wires nearly died when a pole snapped during a fierce wind gust. Orchards in the city suffered near complete loss and many shade trees were also damaged. At least a few chimneys toppled and several others were left leaning. A new bathhouse at Harvard University lost a portion of its tin roof and its copper cornices. At Cape Cod, a wind speed of 45 mph (72 km/h) was observed at Highland Light in North Truro. Waves breached the sane dunes at multiple locations along the cape, with water sweeping across a county road at Beach Point in North Truro. A number of fishing boats sank and several fishhouses were inflicted severe damage. Strong winds in Vermont generated rough seas in Lake Champlain. Early reports indicated that a schooner sunk near Adams Ferry with no survivors, but the vessel was later found safely anchored at Westport, New York. According to a man near the lake, all water from the New York portion of the lake was blown to the Vermont side, crashing ashore in waves as high as 15 to 20 ft (4.6 to 6.1 m). In the state capital of Montpelier, several large trees at the state house were uprooted. Within Montpelier and vicinity, farmers suffered some losses to apples and corn. Telephone and telegraph services were almost completely cut off. In Vergennes, a number of telephone wires snapped, while many apples, pears, and plums were blown off the trees. Additional damage to fruit and shade trees occurred in Middlebury and Winooski. The city of Burlington experienced its worst storm in many years. Winds downed all telephone and telegraph wires, whereas many trees had severe damage. Some homes were deroofed. In New Hampshire, the storm left extensive in the city of Nashua. Winds tore roofs off a number of buildings, with several roofs landing on the streets or telephone wires. Chimneys in each section of the city collapsed; many people narrowly escaped injury or death. In Nashua and the nearby cities of Brookline and Hollis, thousands of dollars in losses occurred to apple crops, described as "practically ruined". The city of Manchester was affected by "one of the most furious windstorms which visited this city in years." Telephone and telegraph communications were nearly completely out for several hours, while windows shattered and trees snapped. Street railway traffic experienced delays. From September 12–14, the extratropical remnants of the Galveston hurricane affected six Canadian provinces, resulting in severe damage and extensive loss of life. In Ontario, tides in Lake Ontario ranged from 8 to 10 ft (2.4 to 3.0 m) above normal, wrecked havoc on vessels, beaching several boats, destroying a number of boats, and setting some others adrift. A number of other vessels canceled or postponed their departures. Peak winds reached 49–77 mph (79–124 km/h) in Toronto, breaking windows throughout the city. A fire broke out at a flour mill in Paris, and the flames were fanned by the storm, resulting in $350,000 in damage to the mill and 50 other stores and offices. High winds downed electrical, telegraph, and telephone lines in many areas. Total crop damage in Ontario alone amounted to $1 million. Impact to crops was particularly severe at St. Catharines, where many apple, peach, pear, and plum orchards were extensively damaged, with a loss of thousands of dollars. One person died in Niagara Falls, when a man attempted to remove debris from a pump station, but he was swept away into the river instead. Maximum rainfall in Canada reached 3.9 in (100 mm) in Percé, Quebec. In Nova Scotia, damage was reported in the Halifax area. A number of fences and trees fell over, while windows shattered and a house under construction collapsed. Two schooners were driven ashore at Sydney and a brigantine was also beached at Cape Breton Island. Another schooner, known as Greta, capsized offshore Cape Breton Island near Low Point, with the fate of the crew being unknown. On Prince Edward Island, a few barns, a windmill, and a lobster factory were destroyed. Falling trees downed about 40 electrical wires. A house suffered damage after its own chimney fell and collapsed through the roof. Strong winds also tossed a boxcar from its track. A bridge and wharf at St. Peters Bay were damaged. Fruit crops were almost entirely ruined throughout Prince Edward Island. The majority of loss of life in Canada occurred due to numerous shipwrecks off the coasts of Saint Pierre and Miquelon, Newfoundland, and Prince Edward Island. The overall death toll in Canada is estimated to be between 52 and 232, making this at least the eighth deadliest hurricane to affect Canada. The large discrepancy between the fatality figures is due to the fact that many people were reported missing in Saint Pierre and Miquelon. Thus, the exact number of deaths is unknown. In less than 24 hours the city of Galveston was effectively obliterated. The final death toll is not known with certainty but the most conservative estimate is around 6,000. Most historians believe the loss of life to be in the area of 8,000 with some suggesting as many as 12,000 perished. With the city in ruins and rail lines to the mainland destroyed, the survivors had little to live on until relief arrived. Survivors set up temporary shelters in surplus U.S. Army tents along the shore. They were so numerous that observers began referring to Galveston as the "White City on the Beach". In the first two weeks following the storm, approximately 17,000 people resided in these tents, vacant storerooms, or public buildings. Others constructed so-called "storm lumber" homes, using salvageable material from the debris to build shelter. The building committee, with a budget of $450,000, opened applications for money to rebuild and repair homes. Accepted applicants were given enough money to build a cottage with three 12 by 12 ft (3.7 by 3.7 m) rooms. By March 1901, 1,073 cottages were built and 1,109 homes had been repaired. Reporter Winifred Bonfils, a young journalist working for William Randolph Hearst, was the first reporter on the line at the flood's aftermath. She delivered an exclusive set of reports and Hearst sent relief supplies by train. By September 12, Galveston received its first post-storm mail. The next day, basic water service was restored, and Western Union began providing minimal telegraph service. Within three weeks, cotton was again being shipped out of the port. A number of cities, businesses, organizations, and individuals made monetary donations toward rebuilding Galveston. By September 15, less than one week after the storm struck Galveston, contributions totaled about $1.5 million. More than $134,000 in donations poured in from New York City alone. Five other major cities – St. Louis, Chicago, Boston, Pittsburgh, and Philadelphia – had also donated at least $15,000 by September 15. Andrew Carnegie made the largest personal contribution, $10,000, while an additional $10,000 was donated by his steel company. Contributions also came from abroad, including $10,000 each from Liverpool and Paris. Clara Barton, the founder and president of the American Red Cross and famous for her responses to crises in the latter half of the 19th century, responded to the disaster and visited Galveston with a team of eight Red Cross workers. This would be the last disaster that Barton responded to, as she was 78-years old at the time and would retire in 1904. After Barton and the team observed the catastrophe, the Red Cross set-up a temporary headquarters at a four-story warehouse in the commercial district. Her presence in Galveston and appeals for contributions resulted in a substantial amount of donations. Overall, 258 barrels, 1,552 pillow cases, and 13 casks of bedding, clothing, crockery, disinfectants, groceries, hardware, medical supplies, and shoes were received at the warehouse, while $17,341 in cash was donated to the Red Cross. Contributions, both monetary gifts and supplies, were estimated to have reached about $120,000. Before the hurricane of 1900, Galveston was considered to be a beautiful and prestigious city and was known as the "Ellis Island of the West" and the "Wall Street of the Southwest". However, after the storm, development shifted north to Houston, which reaped the benefits of the oil boom, particularly after the discovery of oil at Spindletop on January 10, 1901. The dredging of the Houston Ship Channel in 1909 and 1914 ended Galveston's hopes of regaining its former status as a major commercial center. The Galveston city government was reorganized into a commission government, a newly devised structure wherein the government is made of a small group of commissioners, each responsible for one aspect of governance. This was prompted by fears that the existing city council would be unable to handle the problem of rebuilding the city. The apparent success of the new form of government inspired about 500 cities across the United States to adopt a commission government by 1920. However, the commission government fell out of favor after World War I, with Galveston itself switching to council–manager government in 1960. To prevent future storms from causing destruction like that of the 1900 hurricane, many improvements to the island were made. The city of Galveston hired a team of three engineers to design structures for protection from future storms – Alfred Noble, Henry Martyn Robert, and H. C. Ripley. The three engineers recommended and designed a seawall. In November 1902, residents of Galveston overwhelmingly approved a bond referendum to fund building a seawall, passing the measure by a vote of 3,085–21. The first 3 mi (4.8 km) of the Galveston Seawall, 17-foot (5 m) high, were built beginning in 1902 under the direction Robert. In July 1904, the first segment was completed, though construction of the seawall continued for several decades, with the final segment finished in 1963. Upon completion, the seawall in its entirety stretched for more than 10 mi (16 km). Another dramatic effort to protect Galveston was its raising, also recommended by Noble, Robert, and Ripley. Approximately 15,000,000 cu yd (11,000,000 m3) of sand was dredged from the Galveston shipping channel to raise the city, some sections by as much as 17 ft (5.2 m). Over 2,100 buildings were raised in the process of pumping sand underneath, including the 3,000 short tons (2,700 t) St. Patrick's Church. According to historian David G. McComb, the grade of about 500 blocks had been raised by 1911. The seawall was listed among the National Register of Historic Places on August 18, 1977, while the seawall and raising of the island were jointly named a National Historical Civil Engineering Landmark by the American Society of Civil Engineers on October 11, 2001. In 1915, a storm similar in strength and track to the 1900 hurricane struck Galveston. The 1915 storm brought a 12-ft (4-m) storm surge that tested the new seawall. Although 53 people on Galveston Island lost their lives in the 1915 storm, this was a great reduction from the thousands who died in 1900. Other powerful tropical cyclones would test the effectiveness of the seawall, including Hurricane Carla in 1961, Hurricane Alicia in 1983, and Hurricane Ike in 2008. Although Galveston was flooded by storm surge during Carla, severe coastal flood-related damage primarily occurred to structures unprotected by the seawall. Following Hurricane Alicia, the Corps of Engineers estimated that the seawall prevented about $100 million in damage. Despite the seawall, Ike left extensive destruction in Galveston due to storm surge, with preliminary estimates indicating that $2 billion in damage occurred to beaches, dwellings, hospitals, infrastructure, and ports. Damage in Galveston and surrounding areas prompted proposals for improvements to the seawall, including the addition of floodgates and more seawalls. In historiography, the hurricane and the rebuilding afterward divide what is known as the Golden Era (1875–1900) from the Open Era (1920–1957) of Galveston. The most important long-term impact of the hurricane was to confirm fears that Galveston was a dangerous place to make major investments in shipping and manufacturing operations; the economy of the Golden Era was no longer possible as investors fled. In 1920, Prohibition and tax law enforcement opened up new opportunities for criminal enterprises related to gambling and bootlegging in the city. Galveston rapidly became a prime resort destination enabled by the open vice businesses on the island. This new entertainment-based economy brought decades-long prosperity to the island. To commemorate the hurricane's 100th anniversary in 2000, the 1900 Storm Committee was established and began meeting in January 1998. The committee and then-Mayor of Galveston, Roger Quiroga, planned several public events in remembrance of the storm, including theatrical plays, an educational fundraising luncheon, a candlelight memorial service, a 5K run, the rededication of a commemorative Clara Barton plaque, and the dedication of the Place of Remembrance Monument. At the dedication of the Place of Remembrance Monument, the Sisters of Charity of the Incarnate Word sang Queen of the Waves and 10 roses and 90 others were placed around the monument to commemorate the 10 nuns and 90 children who perished after the hurricane destroyed the St. Mary's Orphans Asylum. Speakers at the candlelight memorial service included U. S. Senator Kay Bailey Hutchison, who was born in Galveston; Administrator of the National Oceanic and Atmospheric Administration D. James Baker; and CBS Evening News anchor Dan Rather, who gained fame for his coverage during Hurricane Carla in 1961. The Daily News published a special 100th anniversary commemorative edition newspaper on September 3, 2000. The last reported survivor of the Galveston Hurricane of 1900, Mrs. Maude Conic of Wharton, Texas, died November 14, 2004, at the claimed age of 116, although the 1910 census and other records indicate she was younger than that. Today, Galveston is home to Port of Galveston, the oldest port along the United States Gulf Coast to the west of New Orleans. The city has three institutes of higher learning – Galveston College, Texas A&M University at Galveston, and the University of Texas Medical Branch. American National Insurance Company, a major insurance corporation, is based in Galveston. Homes and other buildings that survived the hurricane have been preserved, and give much of the city a Victorian look. The seawall, since extended to 10 mi (16 km), is now an attraction itself, as hotels, restaurants, and tourist attractions have been built along its length. The Galveston Historical Foundation maintains the Texas Seaport Museum at Pier 21 in the port of Galveston. Included in the museum is a documentary titled The Great Storm, that gives a recounting of the 1900 hurricane. 1934: "Wasn't That a Mighty Storm" is an American folk song concerning the 1900 Galveston hurricane that originated as a spiritual and was revived and popularized by Eric Von Schmidt and Tom Rush in the 1960s. I remember now that it seemed as if we were in a bowl looking up toward the level of the sea. As we stood there in the sandy street, my mother and I, I wanted to take my mother's hand and hurry her away. I felt as if the sea was going to break over the edge of the bowl and come pouring down upon us. 1946: Meteorologist Joseph L. Cline, who with his brother Isaac Cline played a pivotal role in the hurricane, shares his account of the storm in an autobiography titled When the Heavens Frowned. 1999: In Isaac's Storm, Erik Larson describes the storm and the pivotal roles played by Galveston Weather Service director Isaac Cline and his meteorologist brother Joseph Cline. Larson received the Louis J. Battan Author's Award from the American Meteorological Society for his authorship of Isaac's Storm. 2000: Texan writer Ron Rozelle's novel The Windows of Heaven depicts the Galveston hurricane. 2004: Canadian writer Paul Quarrington's novel Galveston, although set on a Caribbean island in the present day, centers on two storm chasing characters who share a lifelong obsession with historical accounts of the Galveston hurricane. 2009: Ain Gordon's play A Disaster Begins centers on the Galveston hurricane. ^ In local time, Central Standard Time (CST), the hurricane made landfall in Texas around 8:00 p.m. on September 8. However, government meteorological agencies such as NOAA use Coordinated Universal Time (UTC), which is six hours ahead of CST. ^ The Canadian dollar and United States dollar were roughly identical in value between January 1879 and August 1914. ^ Although that view was not universally held by all Texas residents, particularly those advocating other Texas seaports. "Galveston Island, with all its boasted accumulation of people, habitations, wealth, trade and commerce, is but a waif of the ocean, a locality but of yesterday ... liable, at any moment, and certain, at no distant day, of being engulfed and submerged by the self-same power that gave it form. Neither is it possible for all the skillful devices of mortal man to protect this doomed place against the impending danger; the terrible power of a hurricane cannot be ... resisted. I should as soon think of founding a city on an iceberg." - D. E. E. Braman (1857). ^ Trumbla, Ron (2007). "The Great Galveston Hurricane of 1900"". NOAA Celebrates 200 Years of Science, Service and Stewardship. National Oceanic and Atmospheric Administration. Retrieved February 3, 2019. ^ Rhor, Monica (May 19, 2016). "Great Storm of 1900 brought winds of change". Houston Chronicle. Retrieved February 3, 2019. ^ Stephens, Sara G. (December 31, 2012). "Portrait of a Legend: The Great Storm of 1900: St. Mary's Orphan Asylum". Houston Family Magazine. Retrieved February 3, 2019. ^ a b c d e f "Atlantic hurricane best track (HURDAT version 2)". Hurricane Research Division (Database). National Hurricane Center. May 1, 2018. Retrieved April 24, 2019. ^ "Central Standard Time Zone - CST". WorldTimeServer.com. Retrieved December 29, 2018. ^ Powell, James (December 2005). "A History of the Canadian Dollar" (PDF). Bank of Canada. p. 97. Retrieved December 30, 2018. ^ a b c d e f Frank, Neil L. (2003). "The Great Galveston Hurricane of 1900" (PDF). AGU. Archived from the original (PDF) on March 25, 2009. Retrieved September 9, 2008. ^ Ackerman, Steven A.; Knox, John (2014). Meteorology: Understanding the Atmosphere (4th ed.). Burlington, Massachusetts: Jones & Bartlett. p. 263. ^ Colby, Frank Moore; et al. (1901). The International Year Book. Dodd, Mead & Company. p. 859. ^ a b c McComb, David G. "Handboox of Texas: Galveston". TSHA handbook. Archived from the original on March 2, 2008. Retrieved September 9, 2008. ^ Landsea, Christopher W.; et al. Documentation of Atlantic Tropical Cyclones Changes in HURDAT. Atlantic Oceanographic and Meteorological Laboratory (Report). Miami, Florida: National Oceanic and Atmospheric Administration. Retrieved April 12, 2018. ^ Texas Almanac: City Population History from 1850–2000 (PDF) (Report). Texas Almanac. Retrieved April 18, 2018. ^ "Galveston marks anniversary of disaster". Longview News-Journal. Associated Press. September 9, 2000. p. 4. Retrieved April 18, 2018 – via Newspapers.com. ^ "A century ago, hurricane left thousands dead". Star-Gazette. Associated Press. September 4, 2000. p. 5. Retrieved April 18, 2018 – via Newspapers.com. ^ Baird, David; Peterson, Eric; Schlecht, Neil E. (2007). Frommer's Texas. Hoboken, New Jersey: Wiley. p. 208. ISBN 978-0-470-08298-0. ^ Frantz, Helen B. "Handboox of Texas Online: Indianola Hurricanes". Archived from the original on July 30, 2007. Retrieved November 27, 2008. ^ Hansen, Gunnar (1993). Islands at the Edge of Time: A Journey to America's Barrier Islands. Island Press. p. 69. ISBN 978-1-55963-252-2. ^ Braman, D. E. E. (1857). Braman's Information About Texas. Philadelphia, Pennsylvania: J. B. Lippincott & Co. p. 46. Retrieved July 15, 2009. ^ a b c Heidorn, Keith C. (September 1, 2000). "Weather people and history: Dr Isaac M. Cline: A Man of Storm and Floods —Part 2". The Weather Doctor. Retrieved February 3, 2019. ^ a b c d Ramos, Mary G. (2008). "After the Great Storm: Galveston's response to the hurricane of 1900". Texas Almanac. Retrieved December 22, 2018. ^ Roker, Al (September 4, 2015). "Blown Away: Galveston Hurricane, 1900". HistoryNet. Retrieved April 18, 2018. ^ a b "The 1900 Storm: An Island Washed Away". Galveston Daily News. Archived from the original on January 24, 2001. Retrieved December 18, 2007. ^ a b Cline, Joseph (January 31, 2000). When the Heavens Frowned. Firebird Press. ISBN 978-1-56554-783-4. ^ Hurst, David (September 25, 2008). "Galveston, Johnstown linked by disaster". Altoona Mirror. Archived from the original on March 4, 2012. Retrieved February 2, 2019. ^ a b c Partagas, Jose F. (1997). Year 1900 (PDF). Atlantic Oceanographic and Meteorological Laboratory (Report). Miami, Florida: National Oceanic and Atmospheric Administration. Retrieved April 13, 2018. ^ Garriott, E. B. (September 1900). "West Indian Hurricane of September 1–12, 1900" (PDF). Monthly Weather Review. 28 (9): 371–377. Bibcode:1900MWRv...28..371G. doi:10.1175/1520-0493(1900)28[371b:WIHOS]2.0.CO;2. Retrieved February 25, 2009. ^ "Bad Storm In Santiago". Wilkes-Barre Times Leader, The Evening News. September 4, 1900. p. 2. Retrieved September 1, 2018 – via Newspapers.com. ^ "Cyclone in Cuba". The New York Times. September 7, 1900. p. 1. Retrieved February 14, 2019 – via Newspapers.com. ^ "Destructive Storm in Jamaica". Chicago Tribune. September 8, 1900. p. 9. Retrieved September 1, 2018 – via Newspapers.com. ^ a b c Blake, Eric S; Landsea, Christopher W; Gibney, Ethan J; National Climatic Data Center; National Hurricane Center (August 10, 2011). The deadliest, costliest and most intense United States tropical cyclones from 1851 to 2010 (and other frequently requested hurricane facts) (PDF) (NOAA Technical Memorandum NWS NHC-6). National Oceanic and Atmospheric Administration. p. 47. Retrieved August 10, 2011. ^ "Ascertainment of the Estimated Excess Mortality from Hurricane María in Puerto Rico" (PDF). Milken Institute of Public Health. August 27, 2018. Archived (PDF) from the original on August 29, 2018. Retrieved August 28, 2018. ^ a b c Weems, John Edward. "Galveston Hurricane of 1900". Handbook of Texas Online. Retrieved December 13, 2018. ^ "Deadly storm came with little warning". Houston Chronicle. December 17, 2007. Archived from the original on December 17, 2007. Retrieved September 28, 2017. ^ a b c d e f g Cline, Isaac M. Galveston Storm of 1900: Introduction (Report). National Oceanic and Atmospheric Administration. Retrieved December 9, 2018. ^ a b c d e f g "Estimated Losses". The Houston Post. September 13, 1900. p. 4. Retrieved February 3, 2019 – via Newspapers.com. ^ Costliest U.S. tropical cyclones tables updated (PDF) (Report). National Hurricane Center. January 26, 2018. p. 2. Retrieved February 3, 2019. ^ "Many Wrecks On Florida Coast". The New York Times. September 8, 1900. p. 1. Retrieved April 13, 2018 – via Newspapers.com. ^ Schoner, R. W.; Molansky, S. (July 1956). National Hurricane Research Project No. 3: Rainfall Associated With Hurricanes (and Other Tropical Disturbances) (PDF) (Report). United States Department of Commerce. p. 248. Retrieved February 14, 2019. ^ "Coast Storm Does Damage". Natchez Democrat. September 7, 1900. p. 1. Retrieved August 31, 2018 – via Newspapers.com. ^ "At Pass Christian". The Semi-Weekly Times-Democrat. September 11, 1900. p. 12. Retrieved August 31, 2018 – via Newspapers.com. ^ a b "Fierce Gale". The Semi-Weekly Times-Democrat. September 11, 1900. p. 12. Retrieved August 31, 2018 – via Newspapers.com. ^ Roth, David M. (April 8, 2010). Louisiana Hurricane History (PDF) (Report). Weather Prediction Center. p. 28. Retrieved September 1, 2018. ^ "Rice Crop Damaged". The Semi-Weekly Times-Democrat. September 11, 1900. p. 12. Retrieved September 1, 2018 – via Newspapers.com. ^ "Farmers Lose Heavily". The Semi-Weekly Times-Democrat. September 11, 1900. p. 12. Retrieved September 1, 2018 – via Newspapers.com. ^ "Two Lives Lost". The Times-Picayune. September 8, 1900. p. 1. Retrieved September 1, 2018 – via Newspapers.com. ^ "The Storm Spends Its Fierce Fury". The Times-Democrat. September 9, 1900. p. 2. Retrieved September 1, 2018 – via Newspapers.com. ^ a b c d e Roth, David M. (January 6, 2010). Texas Hurricane History (PDF) (Report). National Weather Service. p. 47. Retrieved December 29, 2018. ^ a b c "Huge Wave From the Gulf". El Paso Herald. September 10, 1900. p. 5. Retrieved February 12, 2019 – via Newspapers.com. ^ a b c "Summary of Storm News". Victoria Advocate. September 15, 1900. p. 2. Retrieved February 12, 2019 – via Newspapers.com. ^ "Eight Dead at Chenango". Chicago Tribune. September 10, 1900. p. 3. Retrieved February 12, 2019 – via Newspapers.com. ^ a b "Houston Suffered From Storm". The Houston Post. September 10, 1900. p. 3. Retrieved February 12, 2019 – via Newspapers.com. ^ a b "Hhuston [sic] A Mass Of Wreckage". The Los Angeles Times. September 11, 1900. p. 4. Retrieved February 12, 2019 – via Newspapers.com. ^ Olafson, Steve (August 28, 2000). "Unimaginable devastation: Deadly storm came with little warning". Houston Chronicle. Archived from the original on December 17, 2007. Retrieved December 18, 2007. ^ September Normals, Means and Extremes for Galveston (Report). National Weather Service Houston/Galveston, Texas. 2018. Retrieved December 9, 2018. ^ a b The Galveston storm of 1900—The deadliest disaster in American history. National Oceanic and Atmospheric Administration. Retrieved from February 13, 2007, version at archive.org on December 18, 2007. ^ "Galveston Hurricane of 1900". ESSEA. Retrieved September 11, 2008. 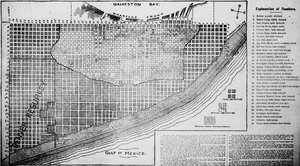 ^ a b c d e f g "Map of Galveston, Showing Destruction By The Storm". The Houston Post. September 27, 1900. p. 7. Retrieved December 8, 2018 – via Newspapers.com. ^ a b c d Turner, Elizabeth Hayes. "Clara Barton and the Formation of Public Policy in Galveston, 1900" (PDF). University of Houston–Downtown. p. 3. Retrieved December 8, 2018. ^ Burnett, John (November 30, 2017). "The Tempest At Galveston: 'We Knew There Was A Storm Coming, But We Had No Idea'". NPR. Retrieved December 8, 2018. ^ "Galveston Hurricane of 1900 - Panoramic View of Tremont Hotel". The Texas Archive of the Moving Image. Retrieved December 9, 2018. ^ "History of The Grand". The Grand 1894 Opera House. Retrieved December 22, 2018. ^ a b "The Property Loss". Pittsburgh Daily Post. March 10, 1901. p. 20. Retrieved December 20, 2018 – via Newspapers.com. ^ "The Sisters of Charity Orphanage". Galveston County Daily News. Retrieved December 9, 2018. ^ "The Strand". Galveston.com & Company, Inc. Retrieved February 14, 2019. ^ "Galveston May be Wiped Out By Storm" (PDF). The New York Times. September 9, 1900. Retrieved November 20, 2007. ^ Green, Nathan C. (1900). Story Of The Galveston Flood. Baltimore, Maryland: R. H. Woodward Company. p. 126. Retrieved July 15, 2009. ^ a b Sullivan, Brian K.; Korose, Tom (September 12, 2008). "Hurricane Ike Set to Slam Texas Coast; Thousands Flee". Bloomberg. Retrieved September 11, 2008. ^ a b Coe, Fanny E. (1911). Heroes of Everyday Life. Ginn and Co. p. 28. ^ a b A. Bowdoin Van Riper. "The Great Galveston hurricane of 1900". The Ultimate History Project. Retrieved February 16, 2019. ^ "Storm Reached Oklahoma". Leavenworth Times. September 11, 1900. p. 8. Retrieved September 3, 2018 – via Newspapers.com. ^ "One Killed at St. Joseph". St. Louis Post-Dispatch. September 12, 1900. p. 2. Retrieved September 3, 2018 – via Newspapers.com. ^ "Chicago Badly Damaged". St. Louis Post-Dispatch. September 12, 1900. p. 2. Retrieved September 3, 2018 – via Newspapers.com. ^ "Wreck of Boat Drowns Six Men". The Weekly Telegram. September 20, 1900. p. 2. Retrieved February 2, 2019 – via Newspapers.com. ^ "Twin Cities Visited". St. Louis Dispatch. September 12, 1900. p. 2. Retrieved February 2, 2019 – via Newspapers.com. ^ "Storm in Michigan". The Times Herald. September 12, 1900. p. 8. Retrieved February 2, 2019 – via Newspapers.com. ^ "Explore Shipwrecks: John B. Lyon". Ohio State University's Sea Grant College Program. Retrieved November 18, 2018. ^ "Water Driven from Toledo Harbor and Vessels Stuck in the Mud". The Cincinnati Enquirer. September 13, 1900. p. 2. Retrieved November 18, 2018 – via Newspapers.com. ^ a b "Great Damage By The Storm In Buffalo". Buffalo Courier. September 13, 1900. p. 7. Retrieved January 31, 2019 – via Newspapers.com. ^ "Lifted Derricp [sic] From The Ground". Buffalo Courier. September 13, 1900. p. 7. Retrieved January 31, 2019 – via Newspapers.com. ^ "New Cast House Was Blown Down". Buffalo Courier. September 13, 1900. p. 7. Retrieved January 31, 2019 – via Newspapers.com. ^ "Exposition's Loss Hard to Estimate". Buffalo Courier. September 13, 1900. p. 7. Retrieved January 31, 2019 – via Newspapers.com. ^ "Havoc Caused at Nearby Resorts". Buffalo Courier. September 13, 1900. p. 7. Retrieved January 31, 2019 – via Newspapers.com. ^ "Course of the Hurricane". The New York Times. September 13, 1900. p. 14. Retrieved February 3, 2019 – via Newspapers.com. ^ a b "City swept by high winds". The New York Times. September 13, 1900. Retrieved February 3, 2019 – via Newspapers.com. ^ "The Water High at The Battery". The New York Times. September 13, 1900. Retrieved February 11, 2019 – via Newspapers.com. ^ "The Storm in Brooklyn". The New York Times. September 13, 1900. Retrieved February 11, 2019 – via Newspapers.com. ^ "Connecticut Fruit Crop Gone". The Boston Globe. September 13, 1900. p. 3. Retrieved November 19, 2018 – via Newspapers.com. ^ "Wind Broke Up Fairs". Hartford Courant. September 14, 1900. p. 3. Retrieved November 19, 2018 – via Newspapers.com. ^ "The Storm at Westbrook". Hartford Courant. September 14, 1900. p. 3. Retrieved November 19, 2018 – via Newspapers.com. ^ "Damage at Providence". The Boston Globe. September 13, 1900. p. 3. Retrieved November 19, 2018 – via Newspapers.com. ^ a b "Death Near to Many". The Boston Globe. September 13, 1900. p. 1. Retrieved November 24, 2018 – via Newspapers.com. ^ "Death Near to Many". The Boston Globe. September 13, 1900. p. 2. Retrieved November 24, 2018 – via Newspapers.com. ^ "Everett Was Hit Hard". The Boston Globe. September 13, 1900. p. 3. Retrieved November 30, 2018 – via Newspapers.com. ^ "Many Accidents in Cambridge". The Boston Globe. September 13, 1900. p. 3. Retrieved November 30, 2018 – via Newspapers.com. ^ a b "Schooner Sunk". The Burlington Free Press. September 13, 1900. p. 1. Retrieved November 19, 2018 – via Newspapers.com. ^ a b "Damage From Wind Storm". The Chelsea Herald. September 20, 1900. p. 5. Retrieved November 19, 2018 – via Newspapers.com. ^ "Storm Strikes in Burlington". Montpelier Evening Argus. September 12, 1900. p. 1. Retrieved November 19, 2018 – via Newspapers.com. ^ "Roofs Flying In Air". The Boston Globe. September 13, 1900. p. 3. Retrieved November 23, 2018 – via Newspapers.com. ^ "Manchester Feels Its Fury". The Boston Globe. September 13, 1900. p. 3. Retrieved November 23, 2018 – via Newspapers.com. ^ a b "1900-1". Environment and Climate Change Canada. Retrieved December 14, 2018. ^ Weinkle, Jessica; et al. (2018). "Normalized hurricane damage in the continental United States 1900–2017". Nature Sustainability. 1: 808–813. doi:10.1038/s41893-018-0165-2. ^ "Hurricane destroyed Galveston in 1900". CNN. September 8, 2008. Retrieved October 5, 2016. ^ a b Bixel, Patricia Bellis; Turner, Elizabeth Hayes (2000). Galveston and the 1900 Storm. University of Texas Press. pp. 70–71. ISBN 978-0-292-70884-6. ^ a b "Work of Committees". Pittsburgh Daily Post. p. 20. Retrieved February 14, 2019 – via Newspapers.com. ^ Kramarae, Cheris; Treichler, Paula A.; Russo, Ann (1992). Amazons, Bluestockings and Crones. Pandora. p. 434. ISBN 978-0-04-440863-5. ^ "Some of the Contributions to the Relief Fund". The Topeka Daily Capital. September 15, 1900. p. 1. Retrieved February 14, 2019 – via Newspapers.com. ^ "History of Galveston Island". Galveston.com & Company, Inc. Retrieved February 2, 2019. ^ "J.H.W. Stele to Sayers, September 11–12, 1900". Texas State Library and Archives Commission. Retrieved February 2, 2019. ^ Rice, Bradley R. (June 12, 2010). "Commission Form of Government". Texas State Historical Association. Retrieved December 29, 2018. ^ a b c Michael A. Smith. "Post-storm rebuilding considered 'Galveston's finest hour'". Galveston County Daily News. Archived from the original on February 16, 2001. Retrieved February 16, 2019. ^ a b "Seawall". Galveston and Texas History Center, Rosenberg Library. October 21, 2004. Retrieved December 29, 2018. ^ "Galveston Seawall_08/18/1997" (PDF). National Park Service. 1977. p. 1. Retrieved February 16, 2019. ^ Clark Bartee (May 16, 2012). Galveston Seawall and Grade Raising Project Located on the Gulf of Mexico, Galveston Island, Texas. Third National Congress on Civil Engineering History and Heritage (October 10-13, 2001). American Society of Civil Engineers. doi:10.1061/40594(265)55. Retrieved February 16, 2019. ^ Frankenfield, H. S. (1915). "August 1915 Monthly Weather Review" (PDF). Weather Bureau. Retrieved September 11, 2008. ^ "Hurricane Alicia, 1983". USA Today. September 21, 2005. Retrieved December 29, 2018. ^ "Chapter III – Economic Environment". Hurricane Ike Impact Report (PDF) (Report). Federal Emergency Management Agency. December 2008. p. 35. Retrieved December 29, 2018. ^ Kaskey, Jack (August 30, 2018). "Houston Eyes Designer Bonds to Pay for $15 Billion Ike Dike". Bloomberg. Retrieved December 29, 2018. ^ a b "100th anniversary calendar of events". Galveston County Daily News. Retrieved December 22, 2018. ^ "Galveston marks anniversary of disaster". Longview News-Journal. Associated Press. September 9, 2000. p. 4. Retrieved December 22, 2018 – via Newspapers.com. ^ Babineck, Mark (September 9, 2000). "Hurricane's victims honored throughout the city". El Paso Times. Associated Press. p. 16. Retrieved December 22, 2018 – via Newspapers.com. ^ "Table of False and Exaggerated Claims" Gerontology Research Group website. Retrieved on September 8, 2012. ^ a b c "Education". Galveston Island Convention & Visitors Bureau and Galveston.com & Company. Retrieved December 29, 2018. ^ "American National Insurance Company". Texas Department of Insurance. Retrieved December 29, 2018. ^ "Pier 21 Theater: The Great Storm". galvestonhistory.org. Archived from the original on June 22, 2012. Retrieved May 29, 2012. ^ "The Great Storm". galvestonhistory.org. Archived from the original on August 31, 2012. Retrieved May 29, 2012. ^ Hinckley, D. (September 12, 2008). "Singing up a 'Mighty Storm' in Galveston". Daily News. New York. Retrieved September 3, 2010. ^ "Wasn't That a Mighty Storm (lyrics)". The Mudcat Café. Retrieved September 3, 2010. ^ "Eric Larson Program at the Main Library". The Public Library of Cincinnati and Hamilton County. 2012. Retrieved February 2, 2019. ^ "Stormy tale holds moments of clarity". Calgary Herald, May 15, 2004. ^ Saltz, Rachel (October 15, 2009). "Seeking Order in a Life, a War and a Deluge". The New York Times. Retrieved February 3, 2019. "1900 Storm". The 1900 Storm 1900storm.com. Galveston Newspapers, Inc. Retrieved December 18, 2007. Bixel, Patricia Bellis; Turner, Elizabeth Hayes (2000). Galveston and the 1900 Storm: Catastrophe and Catalyst (1st ed.). University of Texas Press. ISBN 978-0-292-70883-9. Garriott, E. B. (October 1900). "The West Indian Hurricane Of September 1–12, 1900". National Geographic Magazine. XI (10): 384–392. Retrieved July 15, 2007. Greene, Casey Edward; Kelly, Shelly Henley (2000). Through a Night of Horrors: Voices from the 1900 Galveston Storm. Texas A&M University Press. ISBN 978-1-58544-228-7. Halstead, Murat (1900). Galveston: The Horrors Of A Stricken City. American Publishers' Association. Retrieved July 15, 2009. Larson, Erik (1999). Isaac's Storm: A Man, A Time, and the Deadliest Hurricane in History (1st ed.). New York: Crown Publishers. ISBN 978-0-609-60233-1. Lienhard, John H. "Raising Galveston". The Engines of Our Ingenuity. University of Houston. Retrieved December 18, 2007. McGee, W. J. (October 1900). "The Lessons Of Galveston". The National Geographic Magazine. XI (10): 377–383. Retrieved July 15, 2007. Moore, Willis L. (October 1900). "The Weather Bureau and the Gulf Storms". The National Magazine. XIII (1): 542–546. Retrieved July 15, 2009. Moore, Willis L. (1901). Report of the Chief of the Weather Bureau, 1900–1901. 1. Washington: U.S. Department of Agriculture, Weather Bureau (Government Printing Office). pp. 9–10. Retrieved July 15, 2007. Ousley, Clarence (October 1900). "Thrilling Experiences In The Galveston Storm". The National Magazine. XIII (1): 533–542. Retrieved July 15, 2009. Ousley, Clarence (1900). Galveston in Nineteen Hundred: The Authorized and Official Record. Atlanta, Georgia: William C. Chase. Retrieved July 15, 2009. Weems, John Edward (1957). Weekend in September. Texas A&M University Press. ISBN 978-0-89096-390-6. Wikimedia Commons has media related to Galveston Hurricane of 1900. The 1900 Storm – Galveston Island, Texas – "Remembering the Great Hurricane, September 8, 1900 – A Galveston County Daily News Presentation"
This page was last edited on 24 April 2019, at 18:44 (UTC).